Liebe Kunden, die deutschprachigen Übersetzungen der folgenden Seiten sind derzeit noch in Arbeit. Bei Fragen und Interesse zu den innovativen P-Laser-Produkten sprechen Sie uns bitte an! 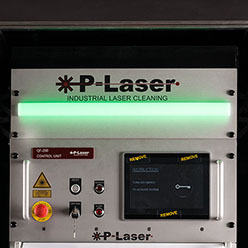 P-Laser develops and produces the world's most advanced industrial laser equipment for manual and automated use. 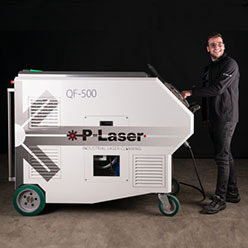 Our laser cleaning systems range from 20 to 1000 watt of extremely precise laser light that effortlessly removes rust, dust, oxides, oil and other contaminations from metal, plastic, ceramics, glass, stone or concrete. 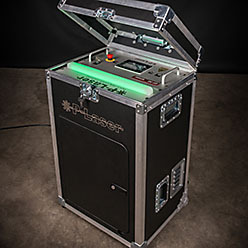 And as this cleaning technique leaves the surface beneath untouched, our laser systems offer unexpected possibilities for a constantly growing number of industrial applications, ranging from marking or labeling to surface preparation for non destructive testing. P-Laser's Low Power systems range from 20W to 100W, delivering high density laser pulses at high pulse rates. Some of the typical Low Power laser applications are mold cleaning, spot repair and preparation of base materials. 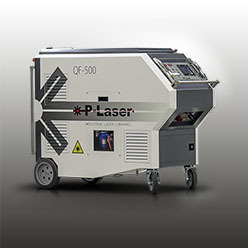 In its Mid Power systems, P-Laser ingeniously combines the very high pulse rate and high density pulses of its Low Power systems with the larger surface coverage of its High Power equipment. The High Power lasers in the 500W to 1000W range are ideal to cover larger areas at a higher speed. They're best suited for larger mold cleaning or industrially stripping paint, grease or rust from large surfaces.